Image caption More than 500 items were auctioned at the Isle of Man Motor Museum in Jurby on Saturday. One of the largest personal collections of TT and Manx Grand Prix memorabilia belonging to the "voice of the TT" Geoff Cannell has been auctioned. The sports broadcaster, who died in 2007 aged 65, commentated on the TT races for 35 years and started his collection as a boy. Auctioneer Murray Keefe said it attracted bids from all over the world. Some lots sold for four times their estimated value including signed pictures of TT star Mike Hailwood. 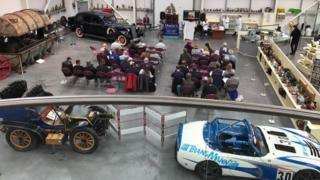 More than 500 items were auctioned at the Isle of Man Motor Museum in Jurby on Saturday. The collection included autographs, photos and programmes dating back to the 1940s when Mr Cannell's stuntman dad Jack raced at the Manx Grand Prix. His daughter Zoe said she hoped all the owners "enjoy their new treasures." Image caption The late broadcaster was considered by many to be the "voice of the TT"